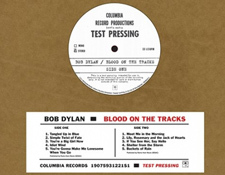 For Bob Dylan fans of a certain vintage, the Record Store Day release of the legendary first test pressing version of the classic 1975 album Blood On The Tracks, is a momentous event. Sure, there has been a boxed set released featuring multiple CDs containing virtually every moment of the two recording sessions which spawned the original album. And there is a two disc LP set highlighting the best of that material (and there is even a sampler stream on Tidal!). But that is still not the original test pressing experience, nor is it complete apparently (more on that in a moment). Non-Dylan fans may be perplexed over the hub-bub surrounding this release. 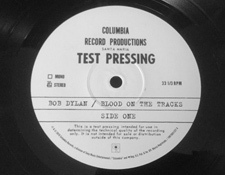 Thus it is important to understand that the Blood On The Tracks Test Pressing represents Dylan's first vision for these songs which are now considered as among the finest of his career. 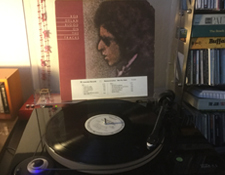 So, here -- finally, after years of only hearing the murky bootlegged version -- we have a fine replica of the actual Blood On The Tracks Test Pressing which was released in a very, very (very) limited quantity in 1974 before Dylan decided to rework the record for its final incarnation (now considered one of his finest works). And again, this seems to include one track not on the boxed set that many Dylan fans have wanted for decades in particular (stay tuned about that...). The boxed set Bob Dylan - More Blood, More Tracks - The Bootleg Series Vol. 14 apparently was frustrating to many fans as it did not include the legendary so called "spooky organ" version of "Idiot Wind" as found on the test pressing. I first caught wind of this (if you'll pardon the pun) while writing this up and poking around the web... and after spot-checking album samples on Amazon for the boxed set (which I don't yet own) I think the fans may well be accurate. I'm happy to report that this new incarnation indeed includes that ominous keyboard part which makes this version of the song so compelling, in its own way separate from the more aggressive rocking version on the final album. Its also nice to hear because for years all many of us got to hear was a bootleg of the original withdrawn bootleg version that had a skip in this song (got that? it was essentially a copy of a copy of, probably, a copy). Those haunting organ swells here sound sort of like what I might have expected The Band's Garth Hudson to play had he been on the session. For me, having this organ version of "Idiot Wind" sounding fantastic is worth the price of admission as it remains a fine and absolutely spine tingling rendition. Another important detail (at least to me) is that this sounds like Blood on the Tracks should sound. Someone paid attention to the production details so this new 2019 release feels like might have sounded in 1974; it has not been brightened up for 21st Century times. I even compared it to my white label promo copy of the final album and it sounds comparable (and that is a real good thing!). I don't know exactly, but it sure sounds to me like they used the original tapes for making this. 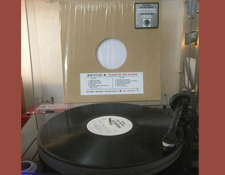 I've read some fan speculation on various and sundry audiophile forums, with some claiming that it was cloned from a pristine test pressing while others suggest that perhaps it was made off the original stampers. The latter is unlikely because the serial numbers on the run out groove don't seem match that of the original test pressing (there is one posted on Discogs and its discussed a lot on the web). So, I suspect its an entirely new LP master reassembled from the master mixes which no doubt reside in the archives. Whatever this source is, the Blood On The Tracks Test Pressing is an important release. It is akin to watching a master painter making a masterpiece in-progress. It gives you a chance to really absorb some of the layers of the production more intimately, especially on the lyrically denser songs, which were delivered in a more fast paced manner on the final release. "Lily, Rosemary & The Jack of Hearts" whizzes by the listener on the final version while this almost folky early version, while arguably less engaging and intriguing as a pop song, is more considered in how Dylan hits you with the words. And while I love the punch of the final version, it is admittedly easier to follow Dylan's storyline on this slower and mesmerizing version of "Idiot Wind." 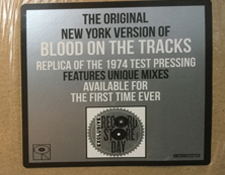 If the figures on the Record Store Day website are correct, 7500 copies of the Blood On The Tracks Test Pressing were pressed. That is a lot of records.... but then there are still a lot of Dylan fans out there so you may want to grab one of these sooner than later. Essential listening.